As mentioned yesterday, you can't have the best Texan fajitas without mouth watering salsa and guacamole. 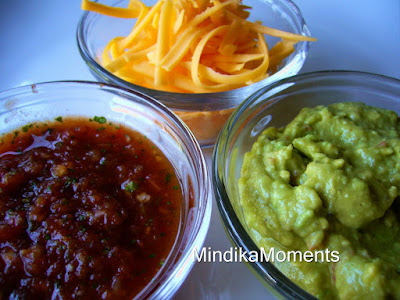 I have spent years perfecting my salsa recipe, to my version of perfect that is. I think I finally have it down. This has been the recipe we've stuck with the longest. It also seems to be a crowd pleaser everywhere we go. I can't take credit for the guacamole, however. This is my sisters recipe. It seems almost too simple to even really be a recipe, but I promise it's the best guacamole you'll ever taste. Sometime simplicity is divine. 1. Put all ingredients into a food processor and pulse until desired consistency; fine or chunky. *All chili's are not created equal, even in the can. If you are sensitive to heat, be sure and take a small little taste of your chili to check the heat level. To control the heat in your salsa add the chili last, incorporating just a quarter or third of the chili at a time until you reach your desired heat level. If you add too much and you need to tone down the heat in the salsa, adding more sugar will help to balance out the heat. Just add a little at a time.